tl;dr: The ICO process was awful, so we decided to fix it. UX is the killer feature for crypto. And it is a huge focus for the BRD product team to build a more seamless experience for getting into crypto, and using our features and services. We’ve gotten a lot of positive feedback so far, but we know there’s still a long way to go before we can compare using crypto to the smooth experiences created by Uber or Amazon. To create the optimal UX, we first need to better understand how people use crypto in general - we wanted to see what our users actually do with their assets. Many of our users are HODLers who use BRD as the most secure wallet to store their assets in the long term. However, among people who actively use their assets, one of the most common use cases turned out to be participating in ICOs. 1 out of 3 users we interviewed had attempted to participate in an ICO. Collectively, ICOs of 2018 have already raised $11,690,981,663 of investments, which is 10 times bigger than the cumulative sum of investments from ICOs of Q1-2 2017. Excluding EOS, the cumulative amount of funding received from ICOs of Q1—2 2018 is 6.4 times bigger than the one of Q1-2 2017. The ICO market has more than doubled in a year. However, anyone who actually tried participating in an ICO will know that it is a very complex and complicated process. I tried to participate in 3 ICOs but only 1 actually got through. In two the transactions just failed. One that worked, but I never got the tokens. It was unclear what was going on. Currently these pieces are not connected in any way, and it’s entirely up to the user to figure out how to move through the process on their own. We launched our own successful ICO in December 2017, and are intimately familiar with the painful process of both running an ICO and attempting to participate in an ICO from the end user’s perspective. Combining our own experience (and having learned from our own mistakes!) with what we’ve heard from our users, we created a process that integrates all of the above steps into a single experience we're calling BRD Secure Checkout. From the moment a potential participant clicks on the BRD Secure Checkout button on a partner ICO website, they are directed onto our website where they follow a simple flow from registration all the way through to actual purchase. After they buy, their tokens are automatically delivered to their BRD wallet. Our goal is to create a platform that is as easy to use as PayPal or Stripe for both users and businesses. 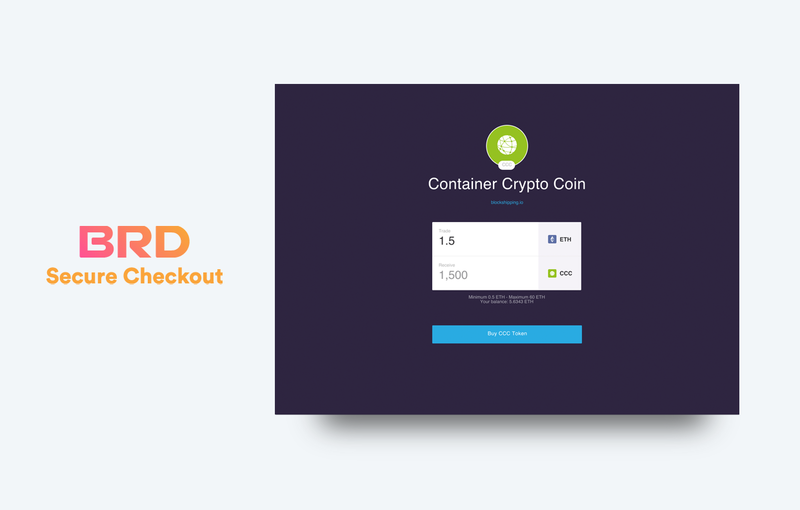 Just like putting a “Pay with PayPal” button on a website, ICO issuers who sign up to use the BRD Secure Checkout service only need to paste in a couple lines of code and we take care of the rest. There is one caveat however: all ICOs that we partner with are taken through a rigorous screening process by our business development team. The process includes interviewing the team, evaluating the white paper and business model, and other metrics. Some of our team members come from the VC world, and this is not dissimilar to what a venture capital firm would do in their due diligence. Our analysis does not predict the future success of the company, but we are careful to not offer our service to any project that appears to be a scam. With BRD Secure Checkout, we've finally found the complete answer to managing the crucial parts of verifying investors, settling their transactions, and protecting their new crypto assets. 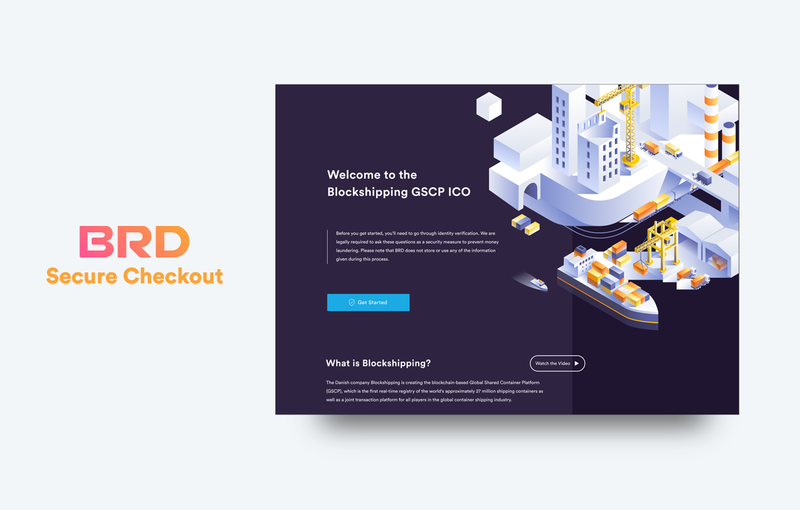 With BRD powering our ICO, Blockshipping can stay focused on our business: building a world-class blockchain platform for the global shipping industry. We are far from being done. Next, we aim to simplify the process of participation even further by allowing users to participate in ICOs by purchasing tokens with their credit card or bank account - without having to buy Bitcoin, converting it into Ethereum, finally sending Ethereum to get their ERC20 tokens - creating a frictionless end-to-end experience from start to finish. This easier and more secure process will allow more people who aren’t yet familiar with crypto to successfully participate in ICOs and other services we will be enabling. UX is a killer feature - but seamless experience across multiple services creates a killer ecosystem.